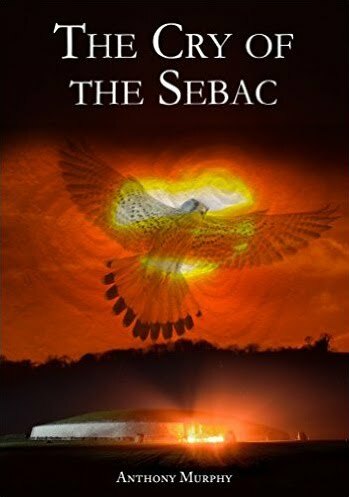 37 years ago, in 1980, Martin Brennan, Jack Roberts and their team of researchers made several significant discoveries relating to the astronomical alignment of several ancient chambered cairns (passage-tombs) in the Boyne Valley region. One such discovery, made in early August of that year, was the apparent alignment of the passage of Cairn S at Carnbane East, Loughcrew. 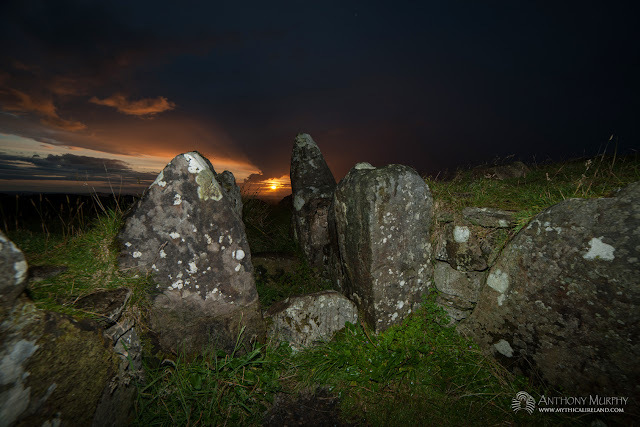 Sitting in the chamber of the (now roofless) cairn, Brennan and his team saw that the Lughnasadh cross-quarter sunset was visible through the passage. Lughnasadh sunset shines down the passage of the ancient Cairn S at Loughcrew. Tonight, for the first time in my 18 years of research and photography, I witnessed what Brennan’s people excitedly discovered back then, and it was spectacular, as you can see. There is a story behind this photograph. With my son Luke accompanying, I drove an hour from Drogheda to Loughcrew this evening with the express purpose of witnessing and photographing this alignment. However, when we got there, a massive cumulonimbus cloud was looming over the whole western horizon. After sitting in the car for a few minutes, we figured that it was moving, albeit slowly, towards us. The sun was hidden. It was clear that this cloud was giving out a lot of rain. So we decided to sit it out. We arrived at 8pm. We knew the sunset would occur at about 9.10pm or so. We sat and waited. Another man who had arrived with camera gear got out of his car and they went up the hill. “A big mistake,” I thought to myself. I could see the rain wasn’t far away and that it was extremely heavy. Sure enough, by about 8.25pm or so it was raining very heavily. The problem was that the cloud was moving extremely slowly. With no let-up in sight, we considered leaving. But having spotted a small patch of blue behind the grey sheets of rain, I decided we’d wait. In the meantime, the gentleman who had gone up earlier returned, quite soaked. After a few minutes, he left in his car. “If needs be, we can leg it up the hill as soon as there’s any let-up in the rain,” I said to Luke. We planned our departure. When the rain finally started to ease, we made a dash for it. It was 8.45pm. Surely this was an exercise in futility? As we ran up the hill (and it was a struggle for me, I can tell you, with the heavy camera equipment on my back), I turned and the sun was appearing beneath the huge black shower cloud. “We might be lucky yet,” I said as we scrambled up that hill. The thing about Sliabh na Calliagh is that, when you want to get up it fast, it seems to take every bit of your energy and determination. By the time we hit the last ascent, the steepest part, I was breathless to the extent of being in a state of near-collapse. Luke took the camera bag for the last stretch. What a fantastic companion to have on this trip – a sprightly, nimble and energetic 15-year-old. After getting in through the gate, we reached Cairn S. I dumped the tripod on the ground, and ordered Luke to put the camera bag down. It was still raining, but the sun was out. I needed to act quickly. We might only have a minute or two to get a photograph. “Which camera?” I thought to myself as I worked out which would work better with remote flash. I decided on the D3X and quickly got set up with the 14mm f2.8 prime lens. It turned out to be a good decision. The photo you see above was taken with this setup. As you can see, the enormous cumulonimbus cloud occupied a huge portion of the sky – but crucially, the sun was out, and just at the right moment! What a capture. What a journey. What a brilliant climax after such an uncertain wait. A wider view of the Cairn S Lughnasadh alignment from outside the chamber. I actually got plenty of time to take photos then – with both cameras, and a variety of lenses. But within a short time the sun went in behind some cloud and the magical moment had passed. Nonetheless, we had captured it, in all its fabulous glory. We were wet. We were cold. We were out of breath. But boy were we happy. After that, we relaxed a bit. The almost-full moon was out. We got lots of other photos – of Cairn S, of Cairn T, of the Hag’s Chair, of Cairn U, and Cairn V. But for now, the magical, mystical shot of the sunset from the chamber of Cairn S is putting a big smile on my face. I feel like I’ve caught up with not just 37 years of history tonight, but over 5,000 years of it. Because of its short passage and wide chamber, it is obvious that Cairn S will align with the sun for some time. I will have to make a return visit in a couple of weeks to see if it is still aligned. Congratulations on some fantastic photos! I always love seeing your work. And thanks to your son for the assist! I'd be interested to hear how many evenings the sunset is visible through the passage. If it was used as a calendar, there must have been a more precise marker for the cross quarter, like a stone at the back where they light could be traced. Long gone I would expect. Great pictures! Thanks for sharing! Terry, I suspect it will actually shine in there for several weeks. It's a short passage with a Y-shaped chamber. I must make a few return trips to see how long it is aligned for. 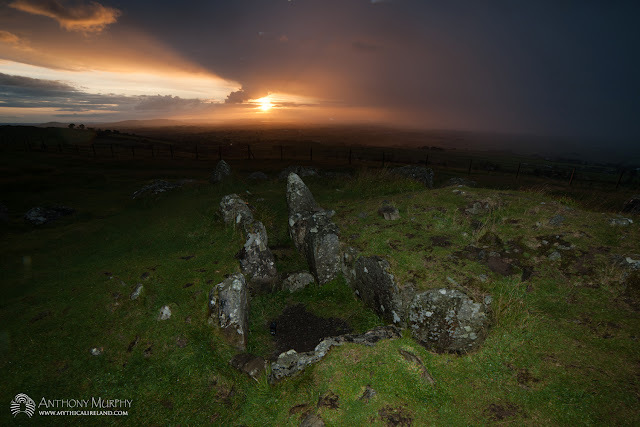 Tara and Loughcrew aligned for Lughnasadh sunset?